Lake Steilacoom is a reservoir that lies just two-and-a-half miles southwest of Tacoma in the city of Lakewood covers more than 300 acres with freshwater which drains into Puget Sound via Chambers Creek. 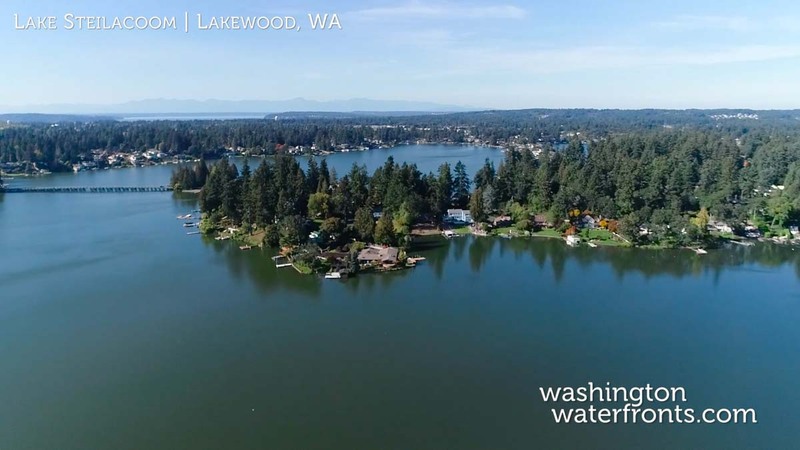 Lake Steilacoom waterfront homeowners have peace of mind in that Lake Steilacoom Improve Club is tasked with overseeing the quality of the lake as well as ensuring treatment for safe, high-quality water for recreational activities. Residents here enjoy the best of lakefront living as well as easy access to outstanding fishing with the lake stocked with rainbow trout and open for fishing from late April through the end of October. Lake Steilacoom waterfront real estate means enjoying everything lakefront living has to offer while being close to big city amenities in nearby Tacoma, including art galleries, museums, microbreweries, a host of restaurants, shops and even minor league baseball at Cheney Stadium. In addition to having immediate lake access the saltwater shores of the South Puget Sound are just minutes away, as is Point Defiance, the second largest city park in the entire nation, with its beautiful beach, zoo and aquarium, living history museum and miles of scenic hiking trails. You’ll be able to enjoy the best of waterfront living on Lake Steilacoom at a much more affordable price compared to many other Puget Sound neighborhoods. Just imagine having your own dock with a covered boat slip and perhaps a relaxation recreation room that opens up to a patio and the glistening expanse of the water. As the least expensive of the three major lakes in Lakewood, that dream is more achievable on Lake Steilacoom than you probably imagined. Of course, that doesn’t mean that there aren’t any luxury Lake Steilacoom waterfront properties available, you’ll find a wide range of options, with many waterfront homes featuring massive spaces with lake views from practically every room and expansive decks that are ideal for watching the sun go down. Take advantage of our industry-leading tools to make your property search as easy as possible and be sure to register for a FREE account so that you can receive email alerts whenever new Lake Steilacoom waterfront real estate for sale hits the market. If you're seeking to sell your Lake Steilacoom waterfront property, contact our Waterfront Specialists directly for a comprehensive listing analysis and to learn more about the cutting-edge marketing strategies we'll use to sell your home quickly for top dollar!